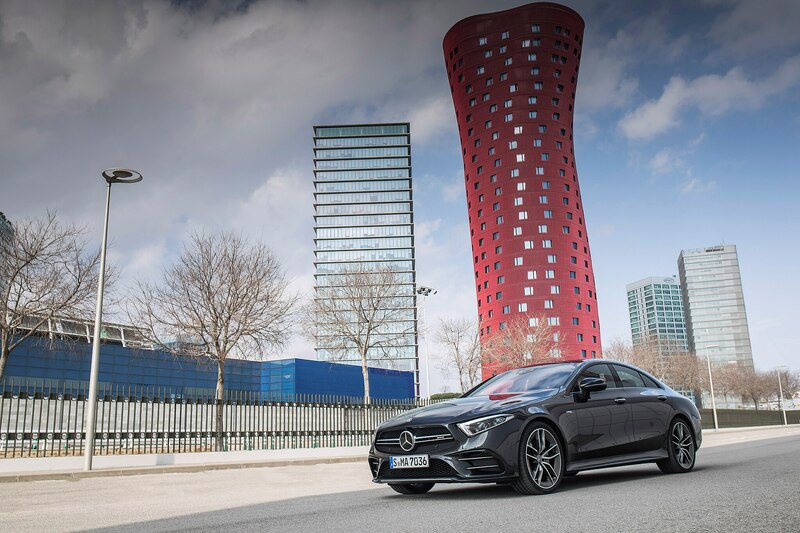 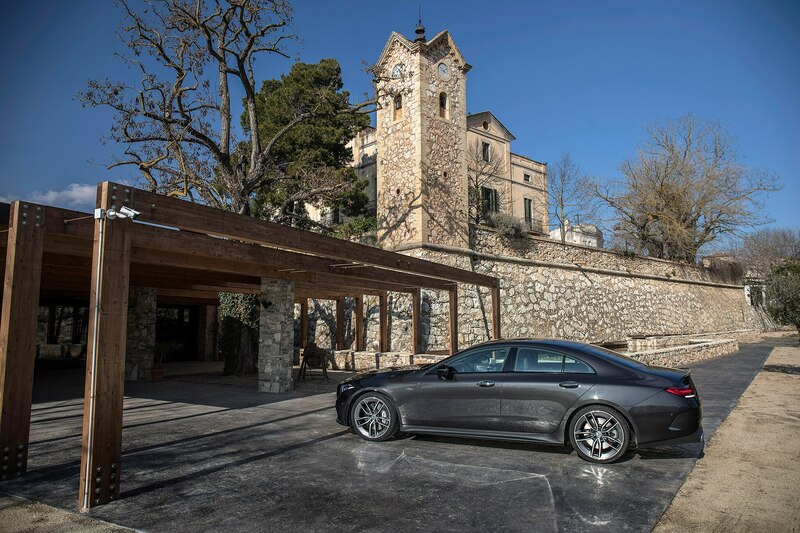 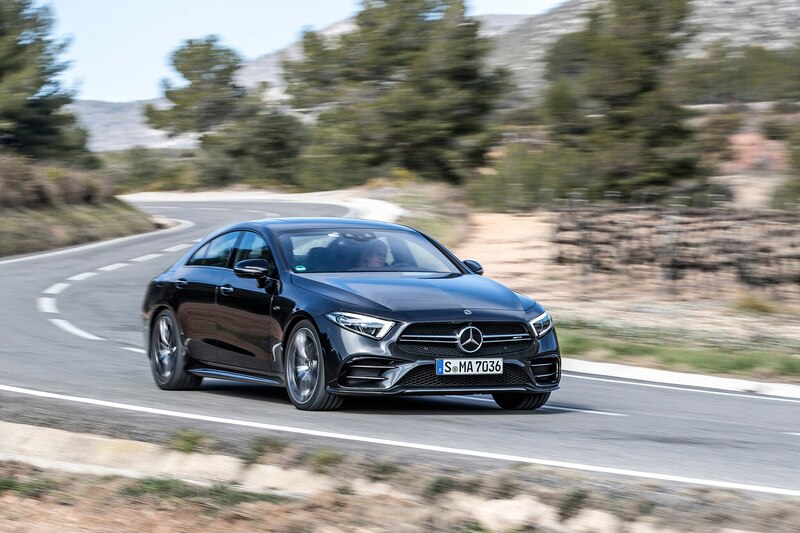 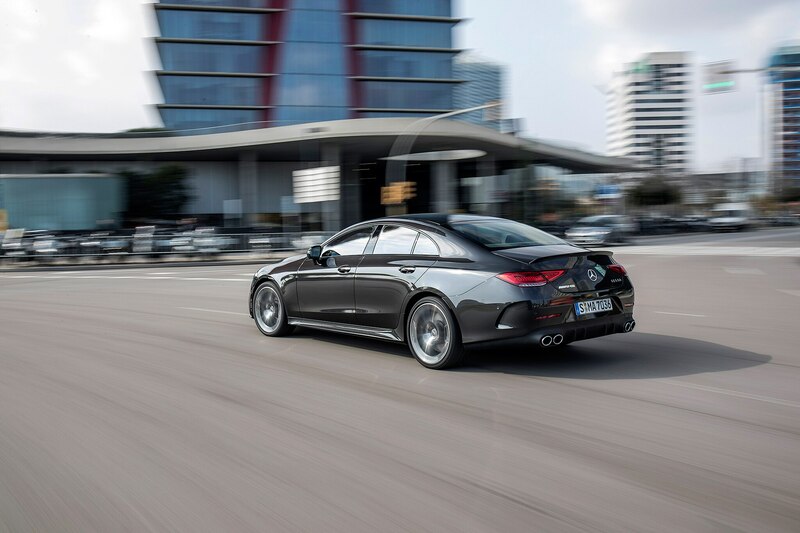 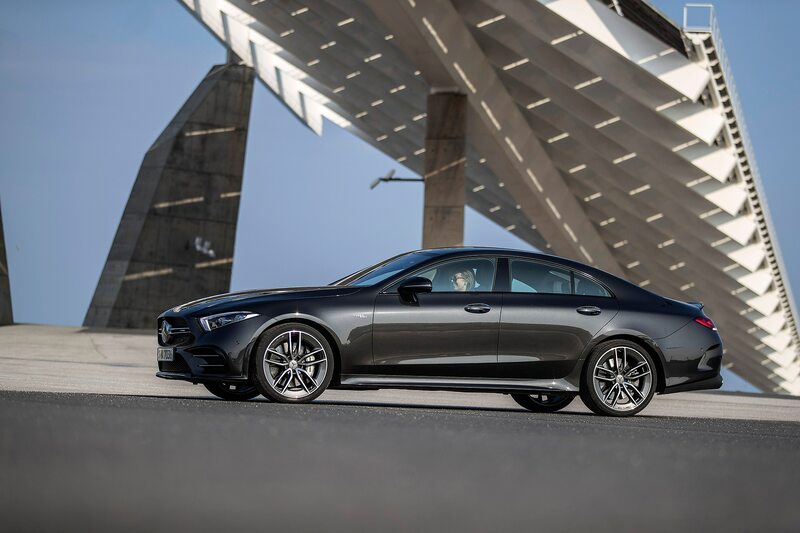 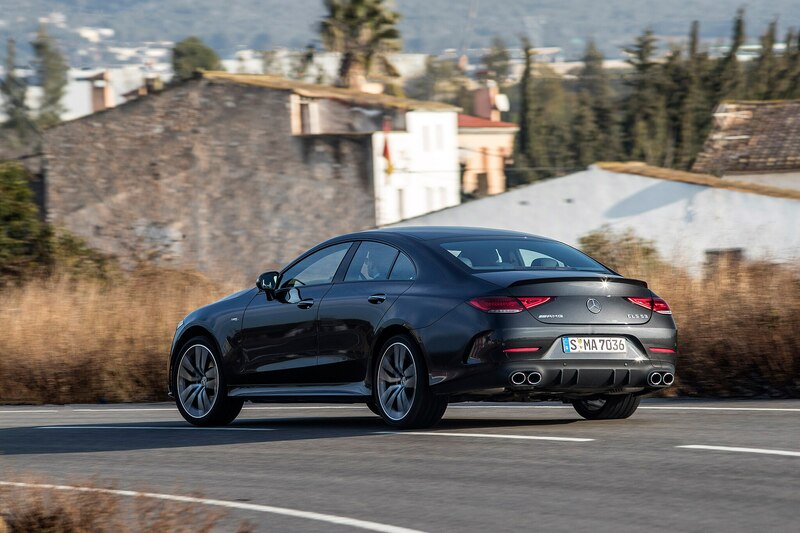 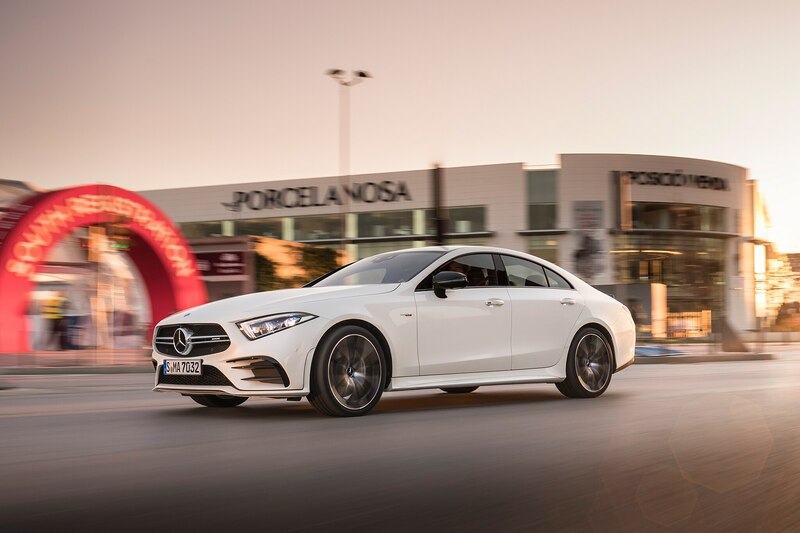 BARCELONA, Spain — With the first turn of the wheel of the 2019 Mercedes-AMG CLS 53 it becomes clear what the rebranding, or watering-down if you will, of Aufrecht Melcher Grosspach is for. 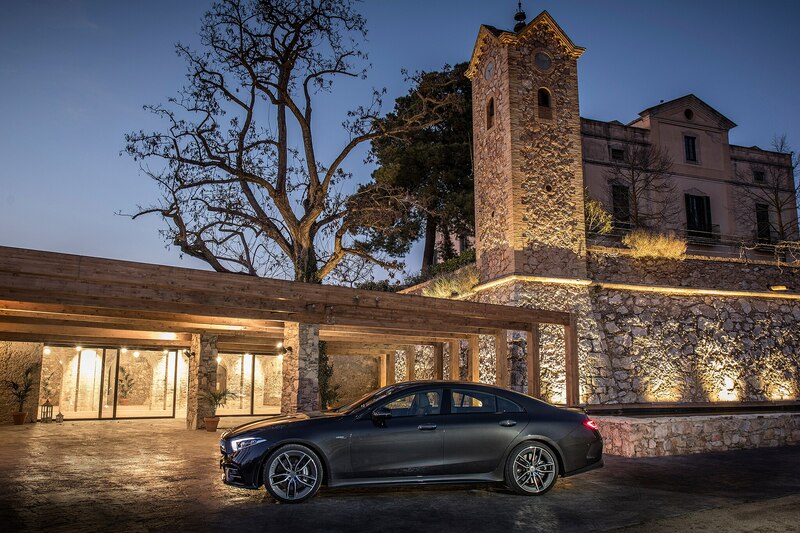 This car smoothly balances the struggle between road comfort and handling that not long ago was BMW’s purview. 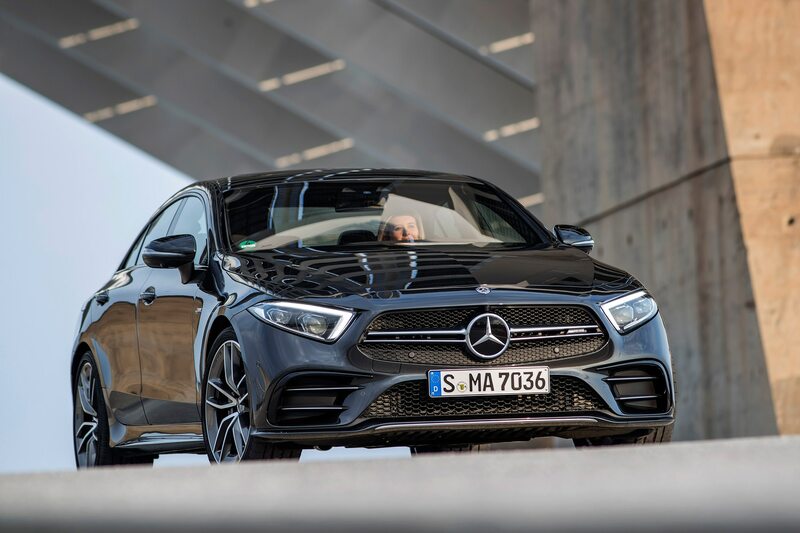 That’s how the new AMG-tuned (versus the AMGs with hand-built engines) models fit in—as the cars and SUVs designed to snag traditional BMW buyers. 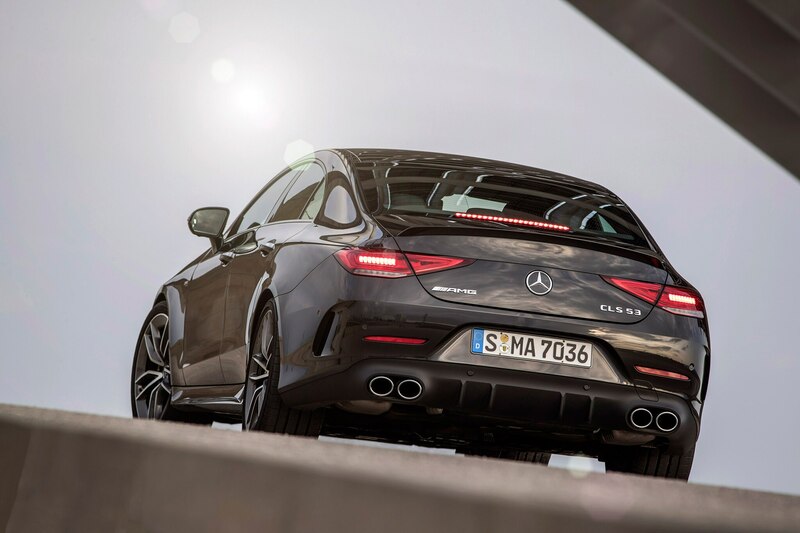 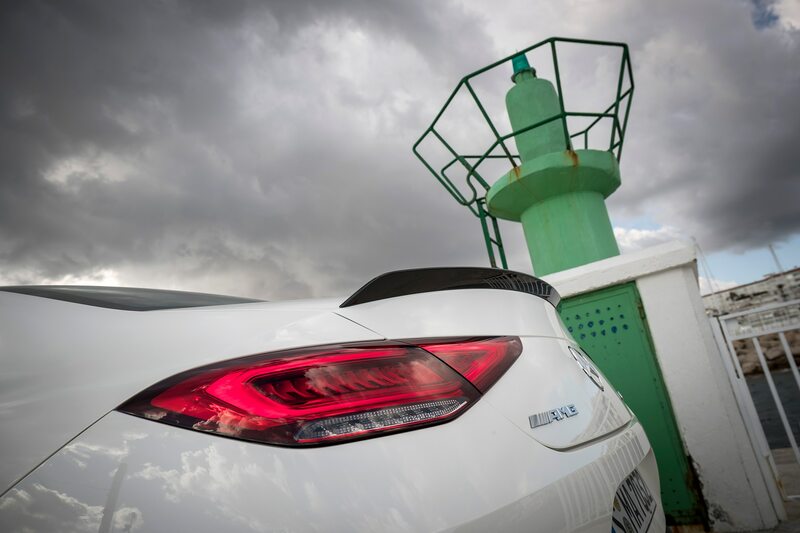 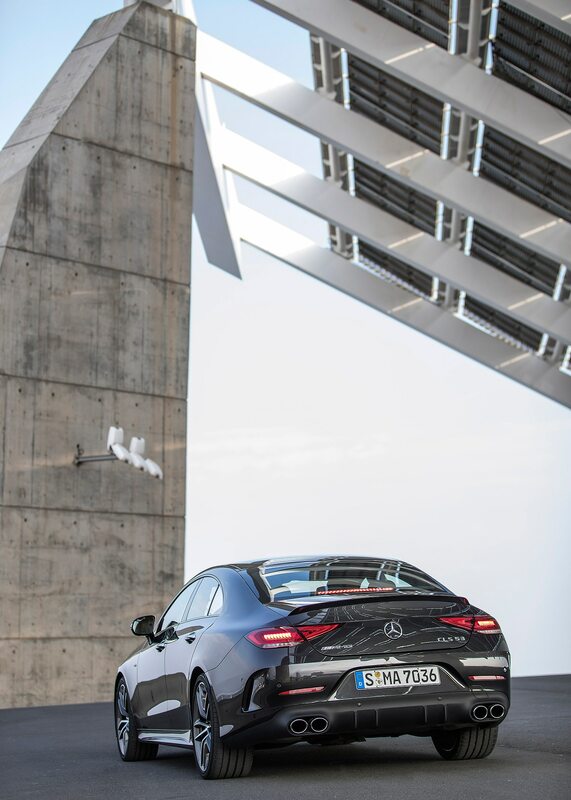 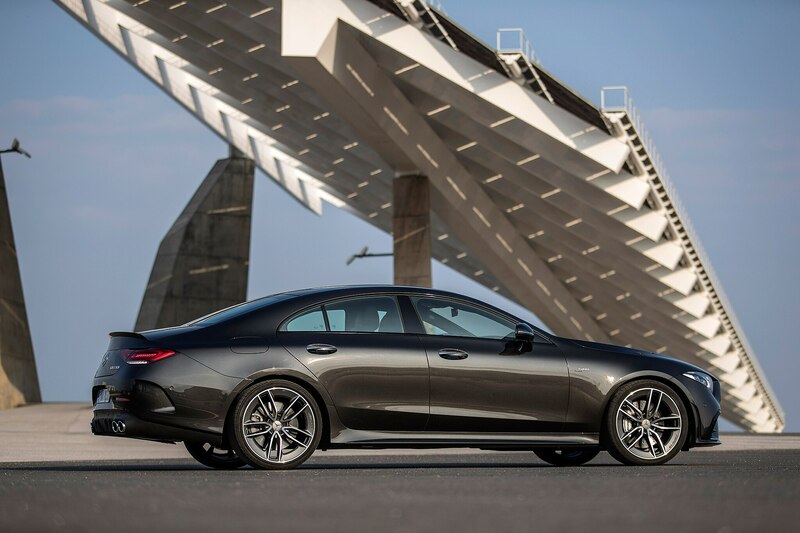 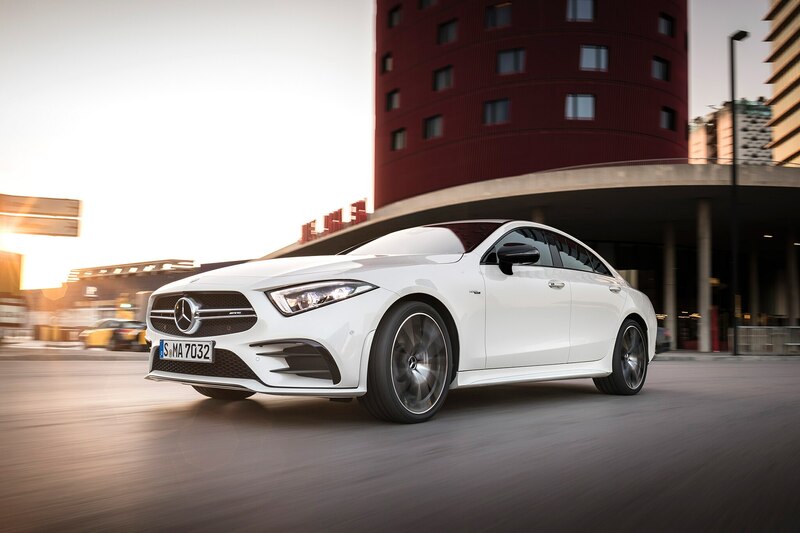 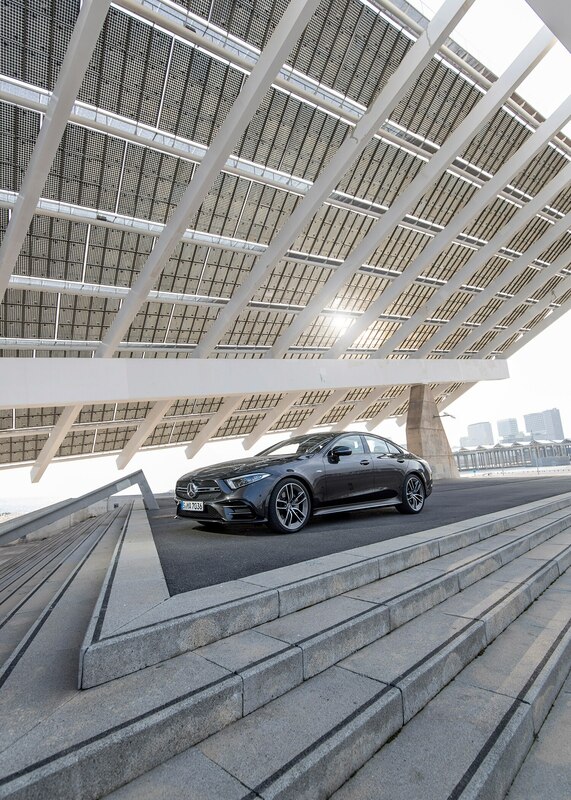 The Mercedes-Benz CLS 450 below it—that second name is Benz, not AMG—and the Mercedes-AMG GT 54, GT 63 and GT 63 S four-door coupe above it bookend this nicely balanced “four-door coupe.” The CLS 450 drives like a traditional Benz, with quieter, less-urgent acceleration and slower steering response, while the GT four-door coupes (no, we didn’t get to drive one) promise to be big, stiff, brutish muscle cars with that traditional AMG runaway-train acceleration. 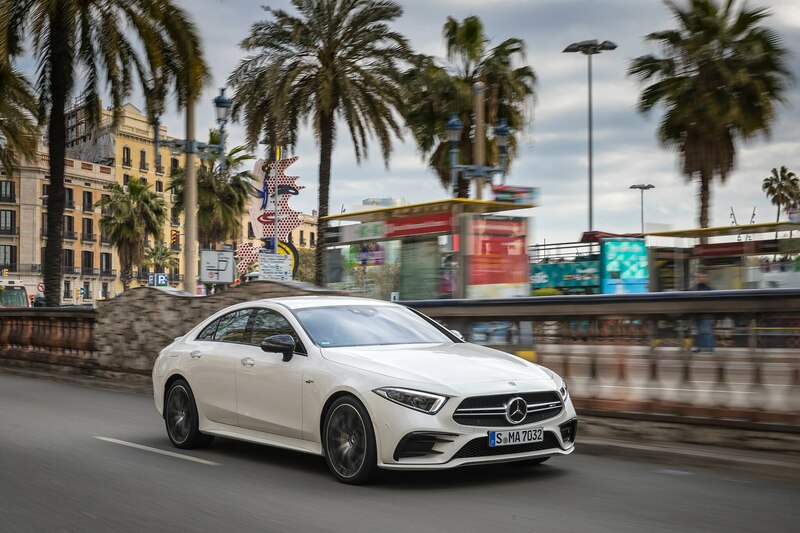 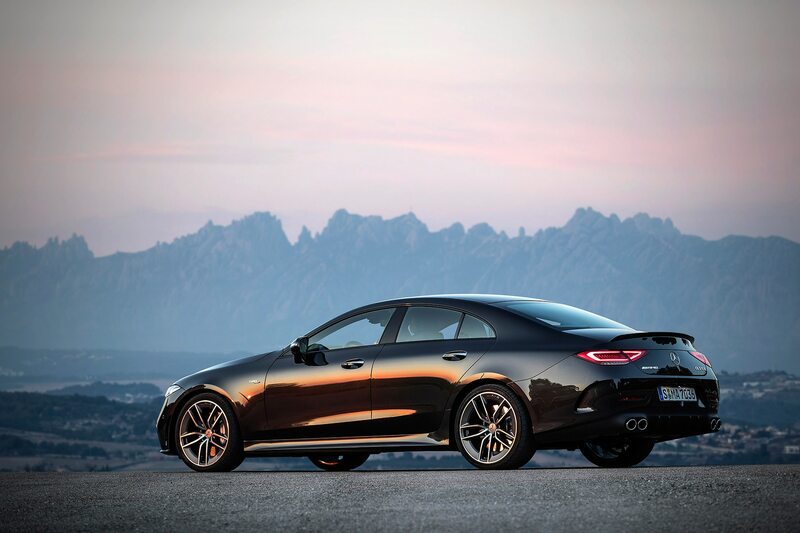 This AMG is not your typical autobahn-crushing muscle car, but a large sport sedan that feels smaller than it is, with perhaps the best-tuned electronic power steering this critic has encountered to date. 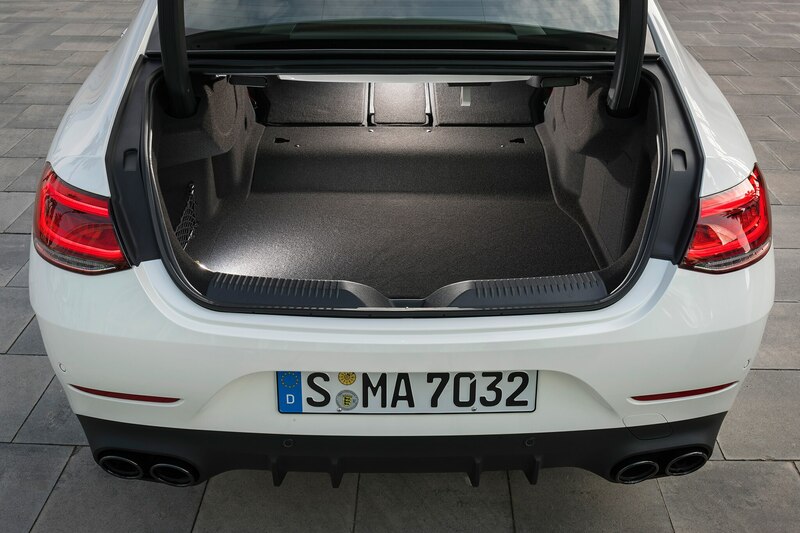 It’s quick and precise without getting too heavy, and complements a firm but smooth chassis with just the right amount of compliance at turn-in, the sort of compliance that only enhances seat-of-the-pants feedback. 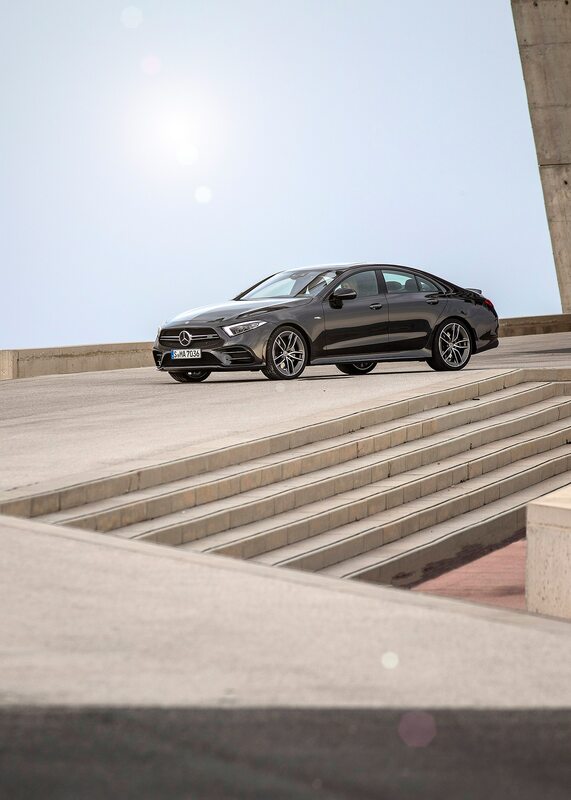 The design of the third-generation CLS-Class looks smooth, too; with the organic, minimalist side surfacing, it’s easily the most handsome of the three generations of this car and maybe the best looking four-door with a fast coupe-like roofline on the market. 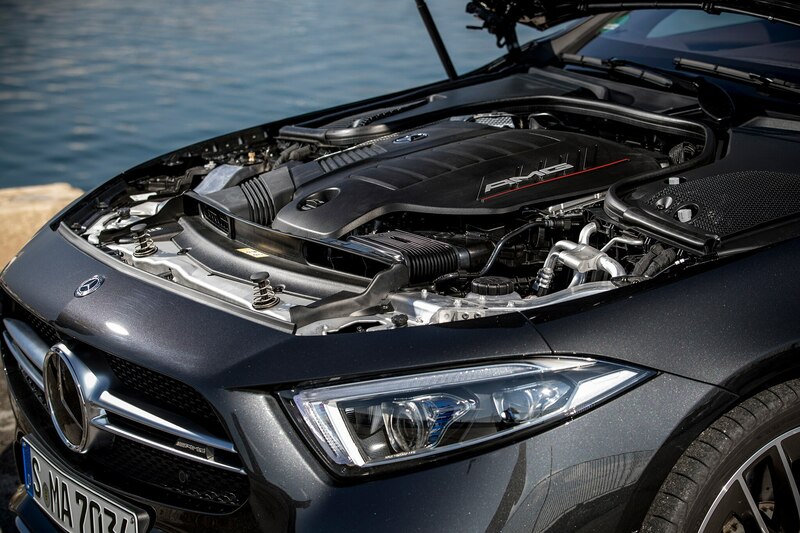 Contributing to the overall feeling of smoothness is Mercedes’ silky new inline six-cylinder engine coupled to a 48-volt electrical system. 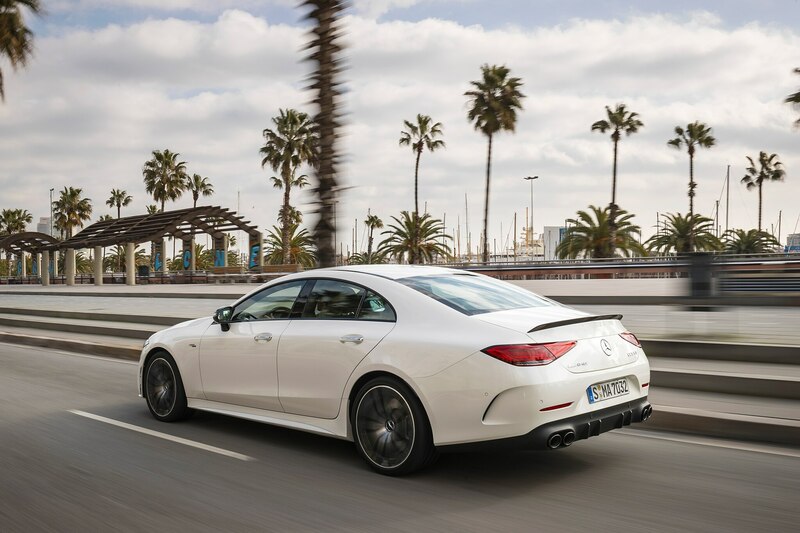 The twin-turbo version of the I-6 made its debut in the European-market S-Class early this year in Europe. 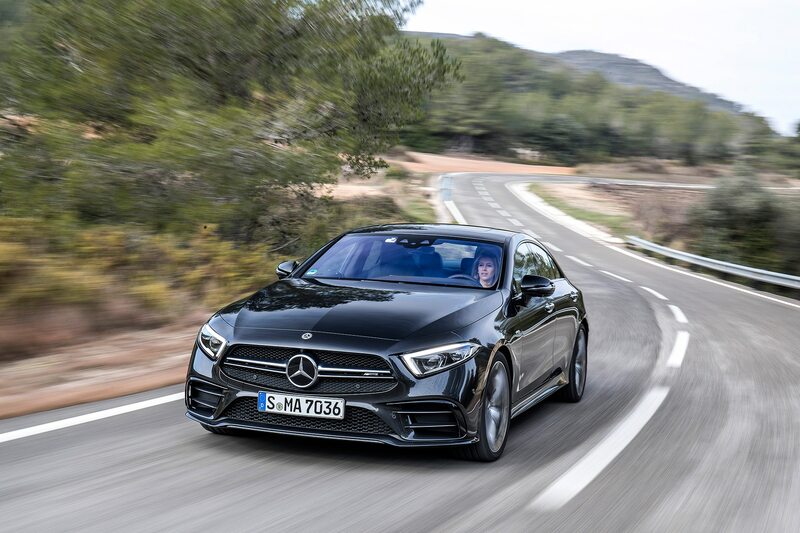 In the CLS 53 4MATIC+ heading Stateside late this year, the twin-turbo 3.0-liter I-6 is rated 435 horsepower, with an additional 22 horsepower “available over short periods” via the EQ Boost mild-hybrid system. 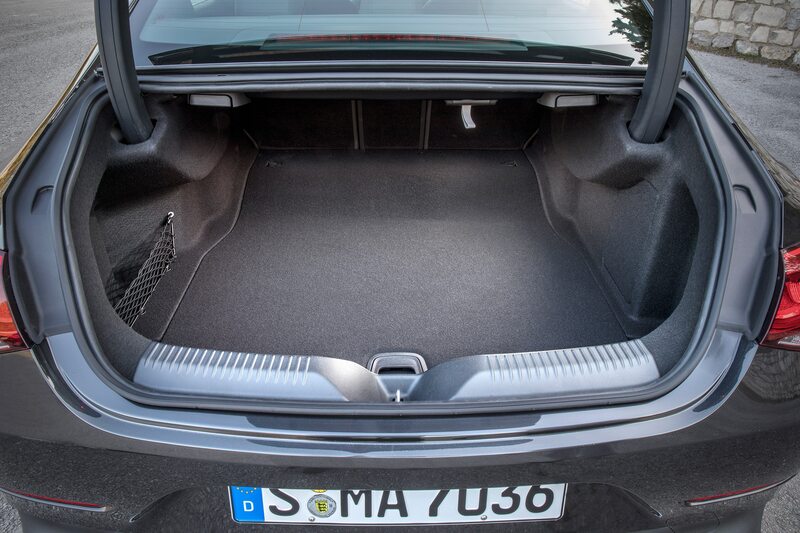 Torque is 384 lb-ft, plus another 185 lb-ft from the 48 volts. 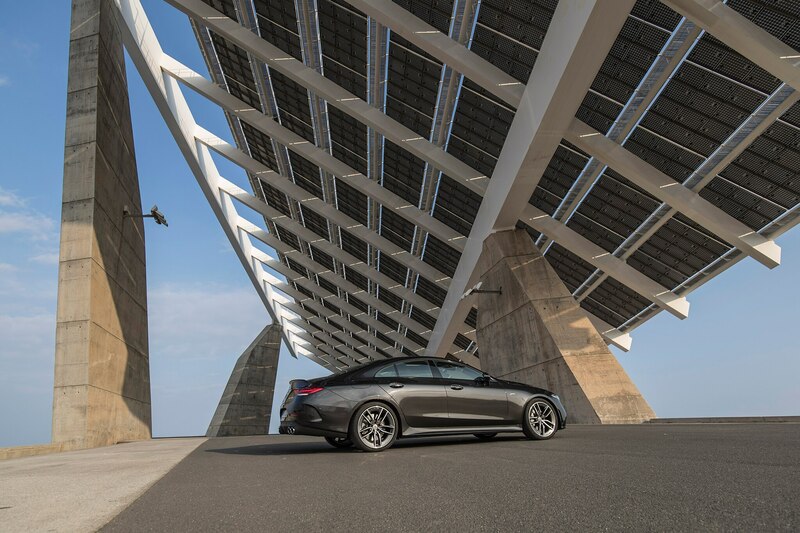 Power comes on progressively and—here’s that word, again—smoothly, and not at all like one of those blown AMG V-8s and V-12s that established the German hot-rod brand’s reputation. 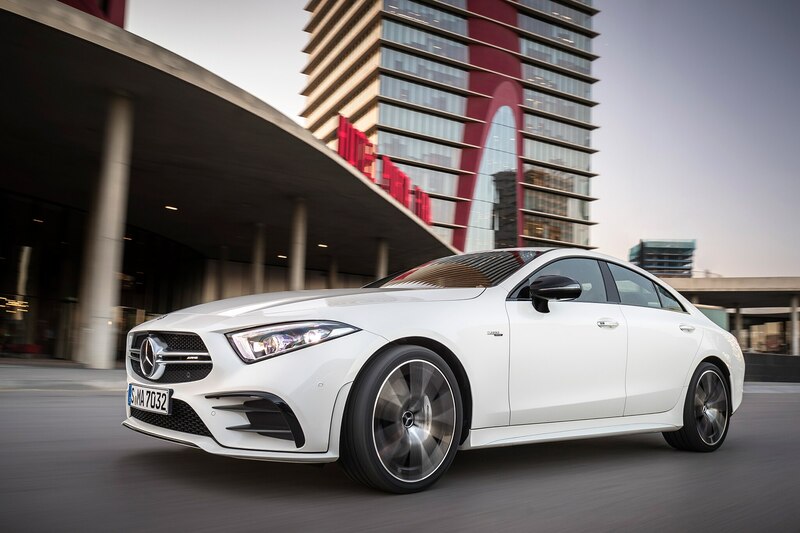 The Mercedes-AMG CLS becomes a different animal with this third-generation model, because it will not be offered with any V-8 option. 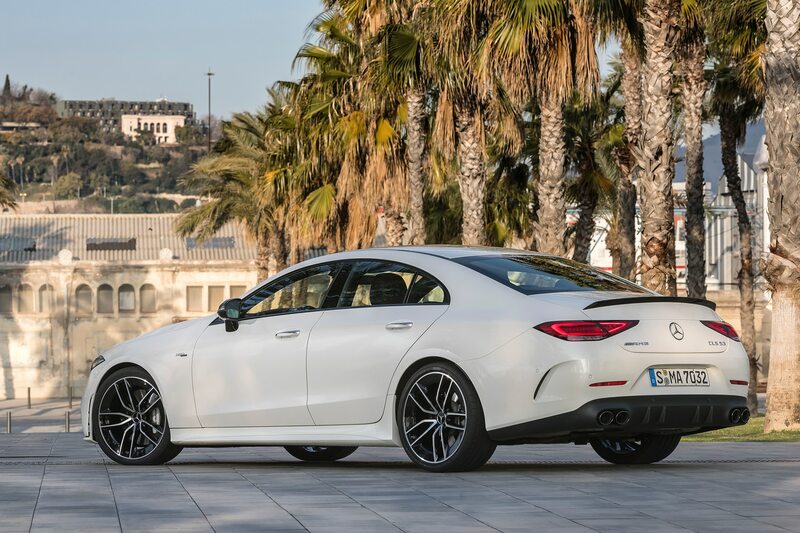 You’ll have to move up to the Mercedes-AMG GT 63 four-door if you want V-8 power. 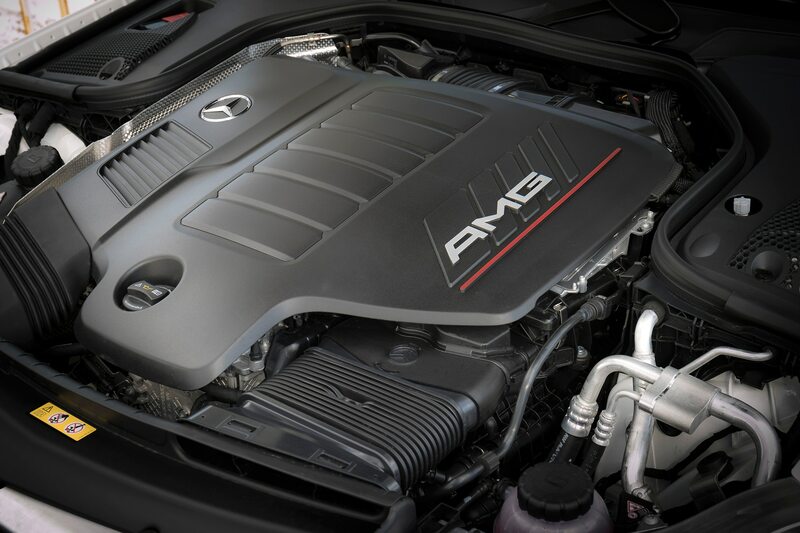 The “53” in both the AMG CLS and the AMG GT 53 four-door are not hand-built engines, but are “AMG-tuned.” This engine does have an electronic compressor that kicks in 0.3-second into the launch, for lag-free power. 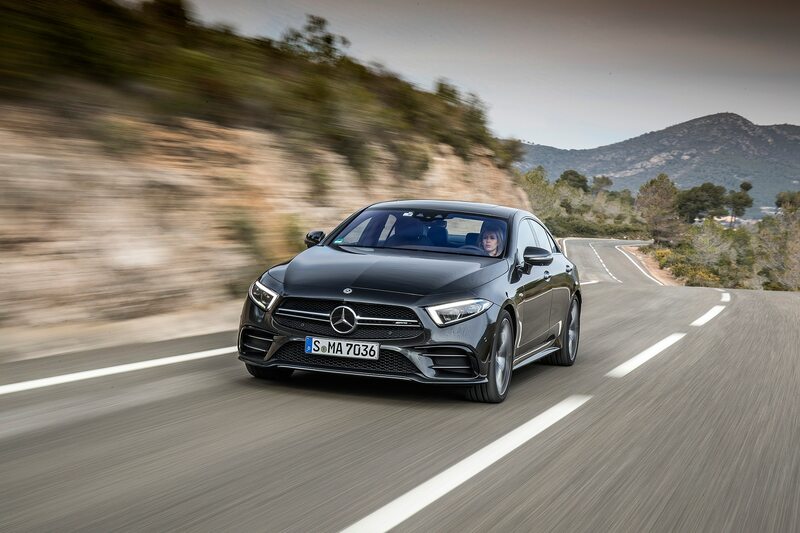 So once again, “smoothness” is the operative word, and if you’re an enthusiast who prefers that sort of driving style, you might prefer it to the acceleration sensations of being pushed back into your handsomely finished, aggressively bolstered driver’s seat that you get from a hand-built AMG V-8. 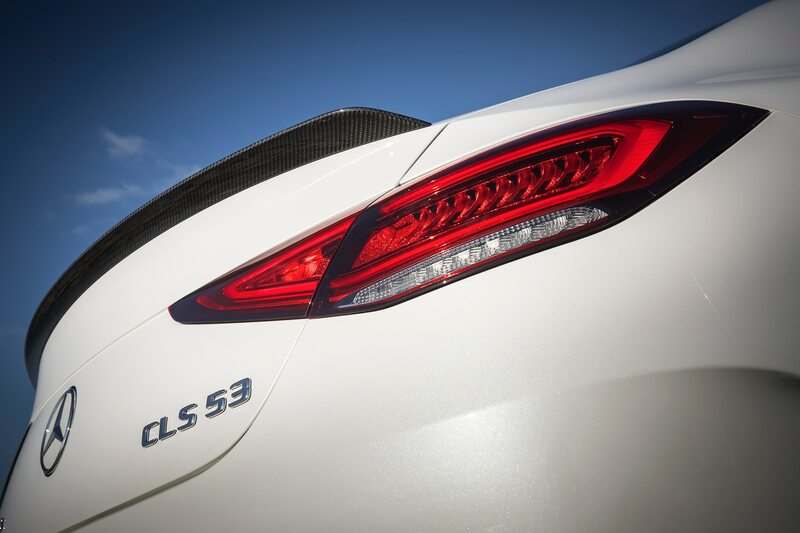 The 53 engine’s exhaust burble might at first seem out of place in this car’s sublime environment, but it’s a healthy burble that amps up in Sport and Sport+ modes; a proverbial motorboat burble that manages to sound exciting and comforting at the same time. 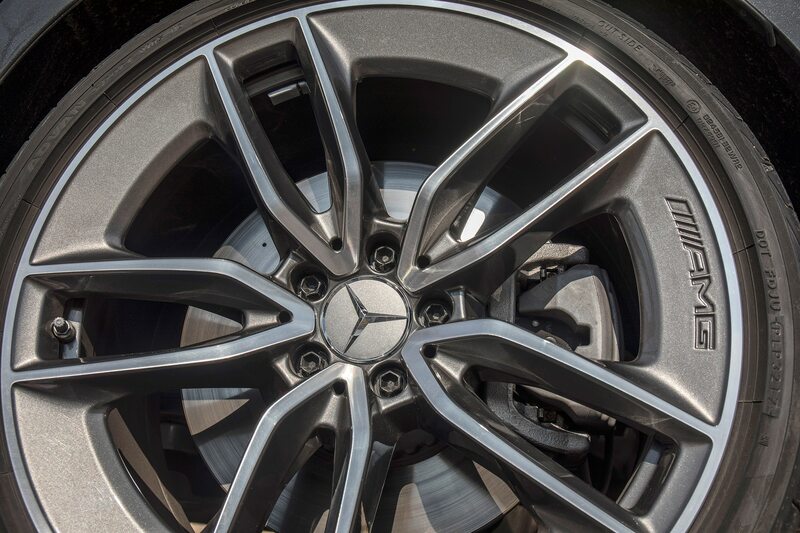 Same with the brakes, which are as effective and progressive as you can find, with no grabbiness. 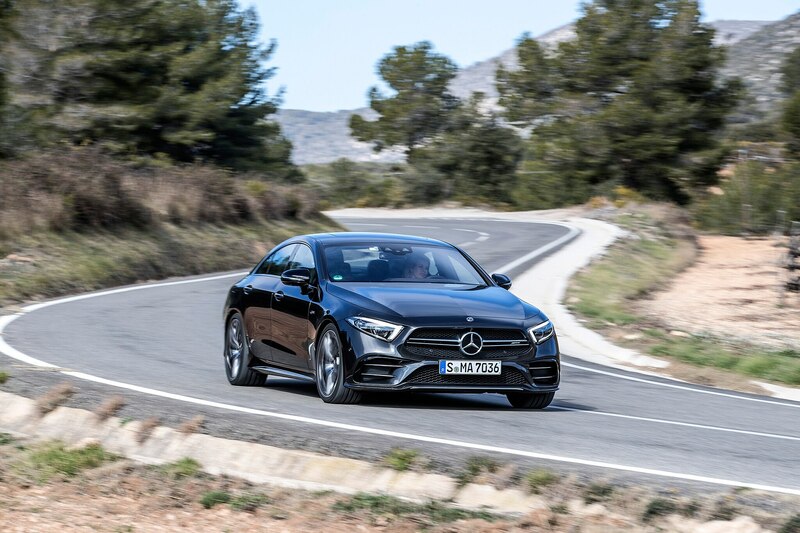 We played around with the dynamic settings and couldn’t discern any difference in suspension between Sport and Sport+, although a Mercedes engineer says the added stiffness of Sport+ is more obvious at higher speed and/or tighter corners than we managed in Catalunyan mountain traffic. 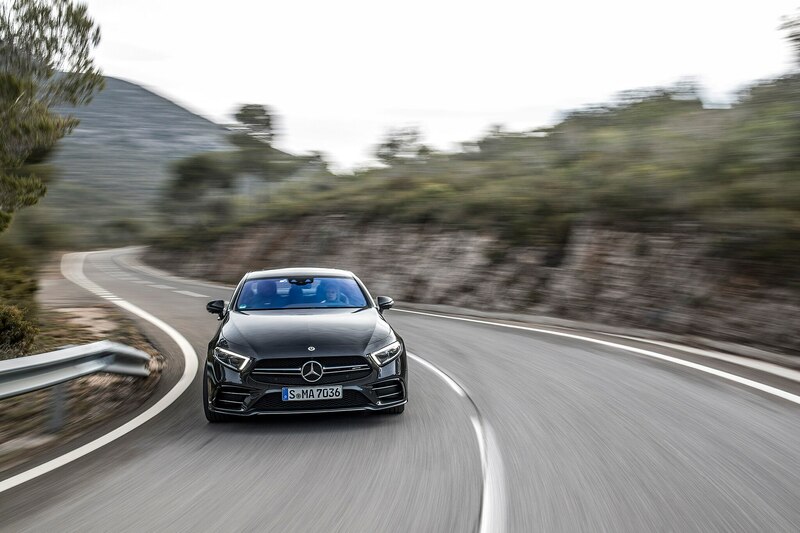 Differences between Sport and Sport+ in the 9G-Tronic’s automatic shift patterns are obvious though, especially in these mountains. 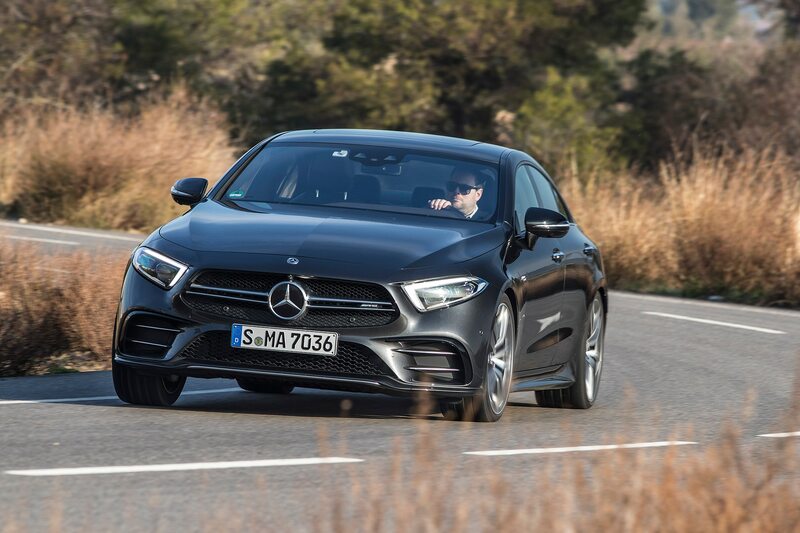 You would probably perennially keep this car in Sport for the aggressive upshifts and downshifts, which perfectly match the twisty uphill and downhill runs. 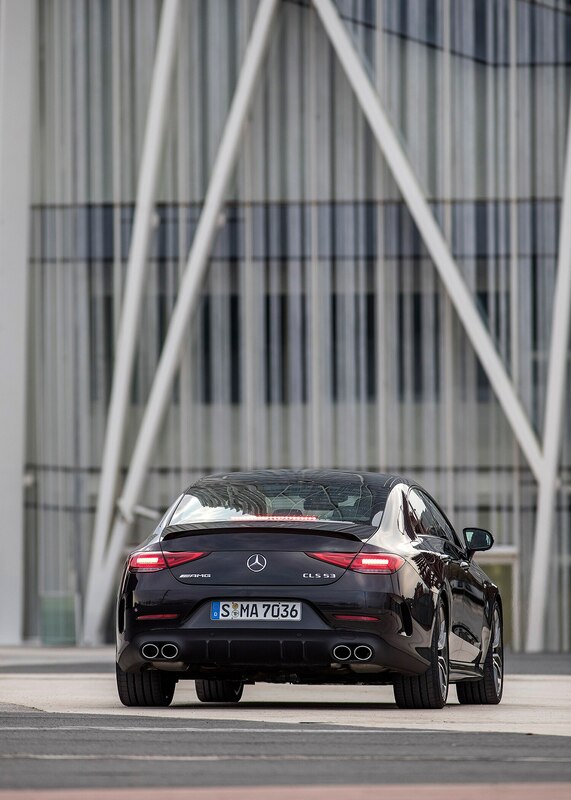 With that exhaust rumble, it’s like AMG dropped a soundtrack from one of Lewis Hamilton’s drives into the audio system. 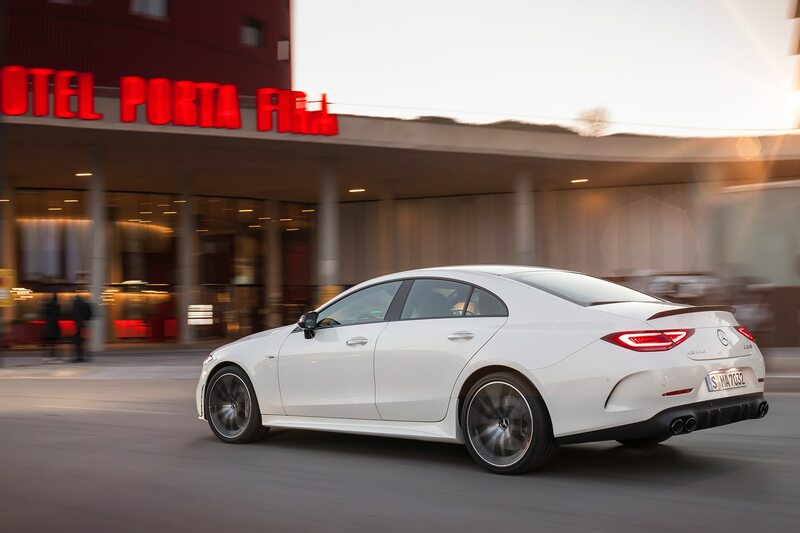 So how can you tell you’re in Sport+? 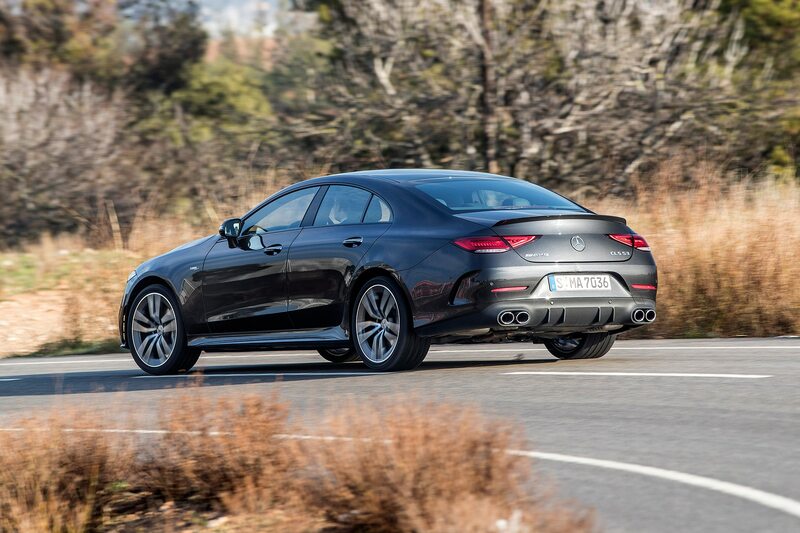 It holds lower gears a bit longer, which means maybe a bit less upshifting and downshifting. 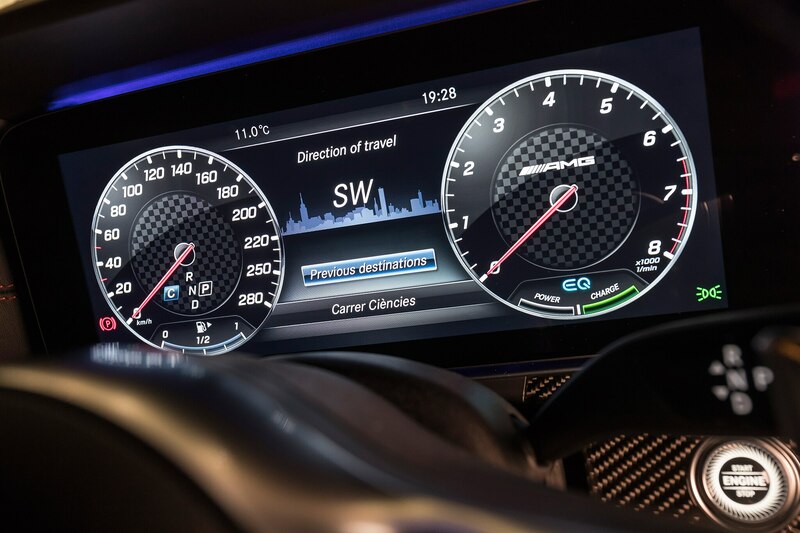 The only reasons to consider Comfort mode are fuel efficiency, and Metro Detroit roads. 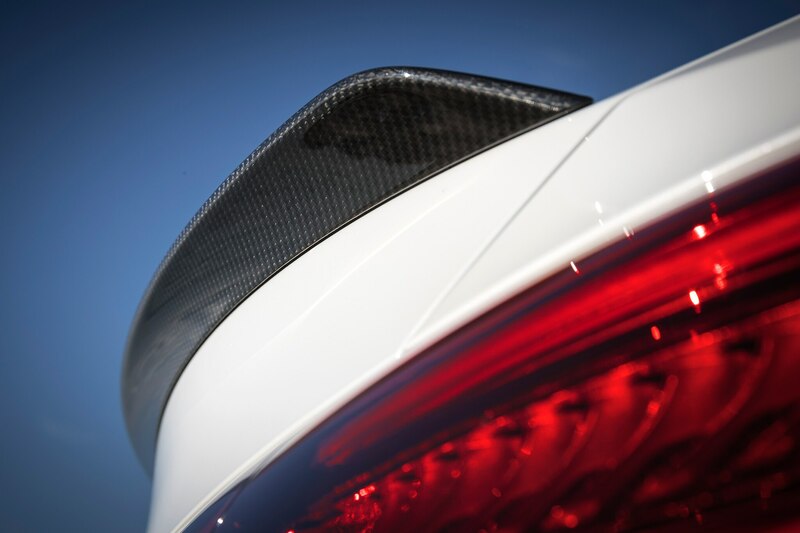 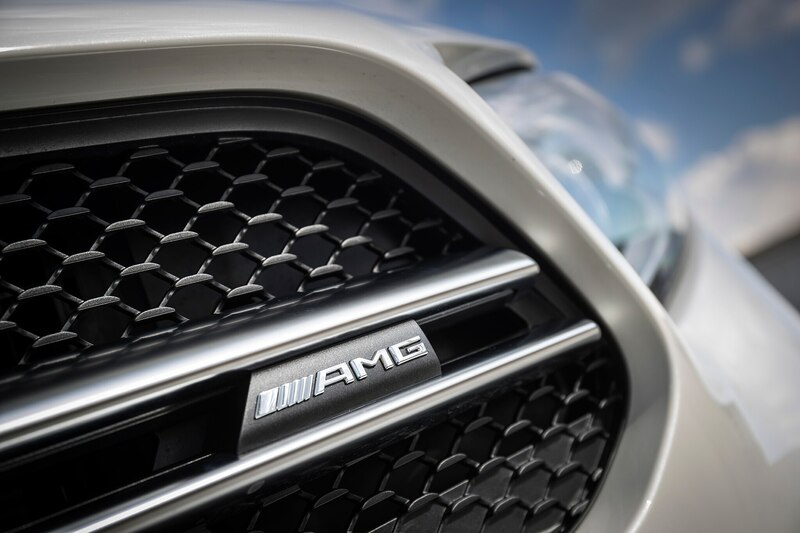 This all comes from a driver’s seat that will be familiar to anyone who has driven any sort of sporting Mercedes. 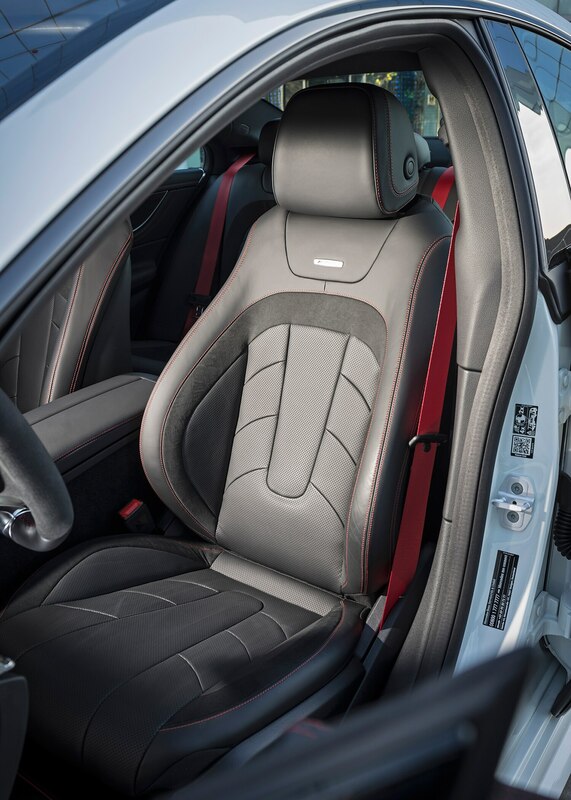 The seats are comfortable and as noted earlier, well-bolstered, and they’re active bolsters, if you so choose. 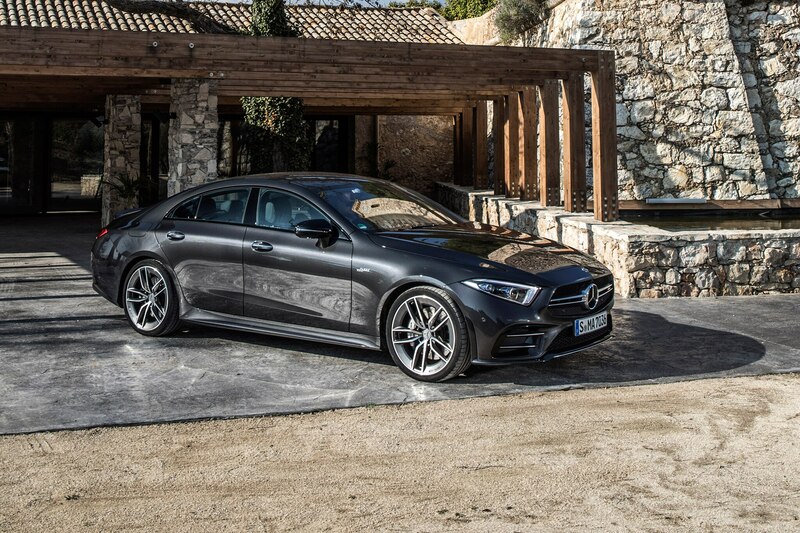 There’s probably a massage setting in the Mercedes-AMG CLS 53 4MATIC+’s front seat controls, though I didn’t bother to check until we drove the less sporting CLS 450 4MATIC. 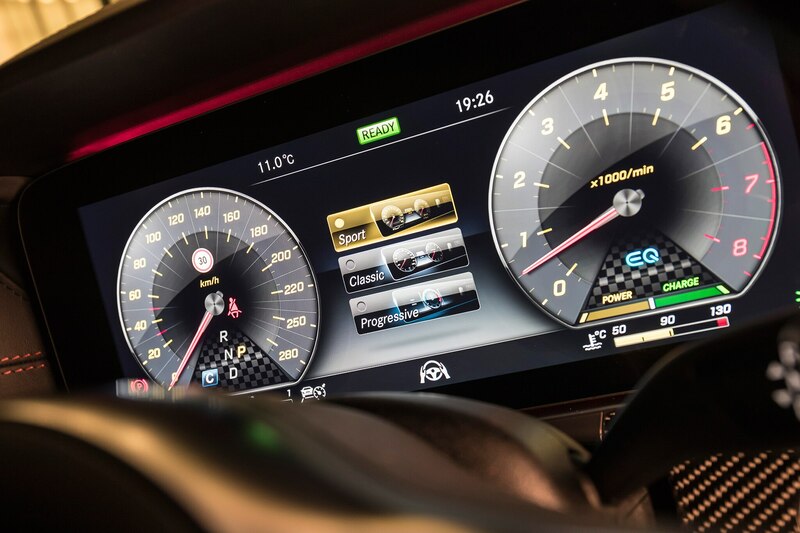 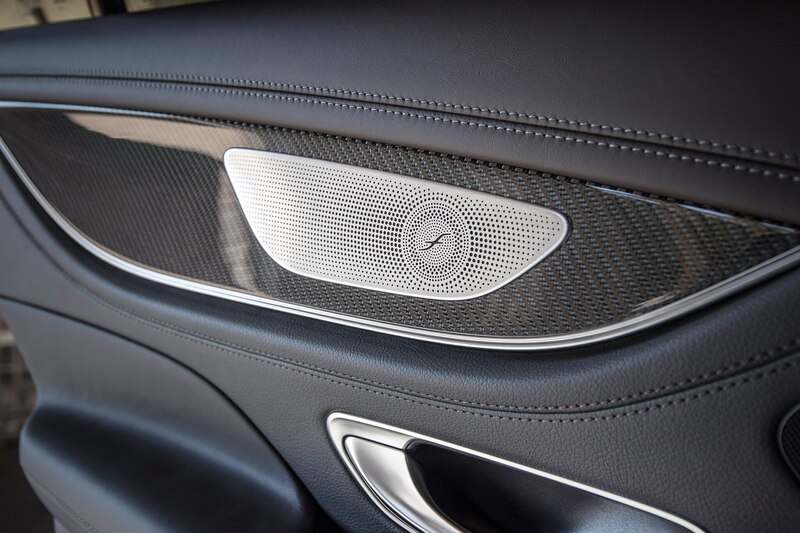 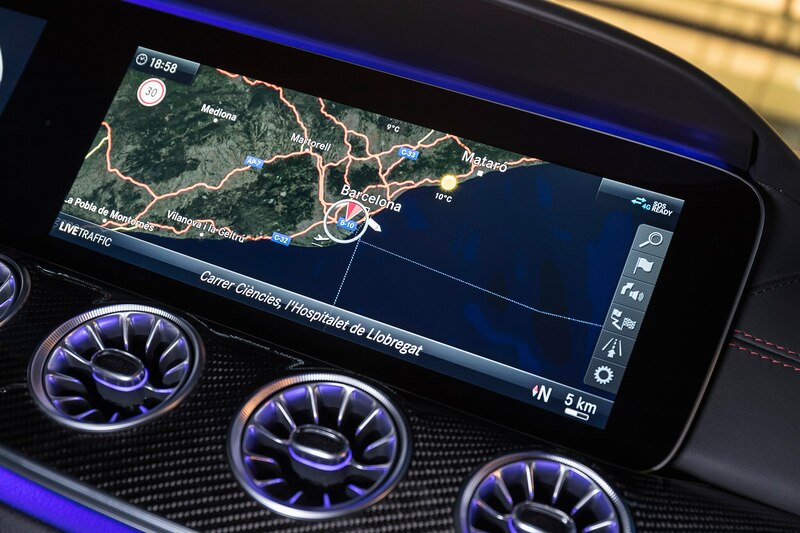 The CLS features Mercedes’ new “Widescreen” cockpit, with a long expanse of rectangular glass covering two 12.3-inch displays—one for the navigation/audio system and the other for the gauges, reconfigurable as Sport, Classic, and Progressive. 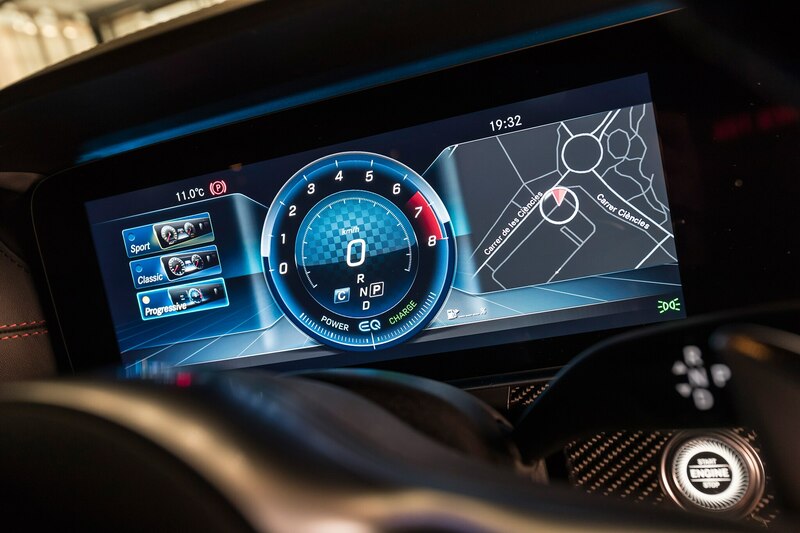 This upright display, and the small column-mounted electronic gearshift, seems a bit conservative for the swoopy CLS at first glance, but it’s sleek, relatively simple and straightforward, and it works. 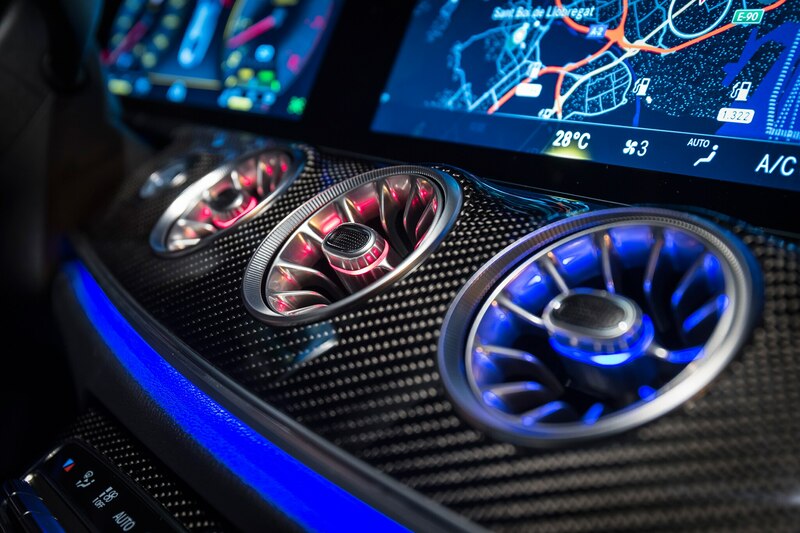 It’s topped with a richly padded, stitched leather dashboard cover, and surrounded by round, color-coded vents that glow blue when you’re cooling down the cabin, and red when you’re heating it. 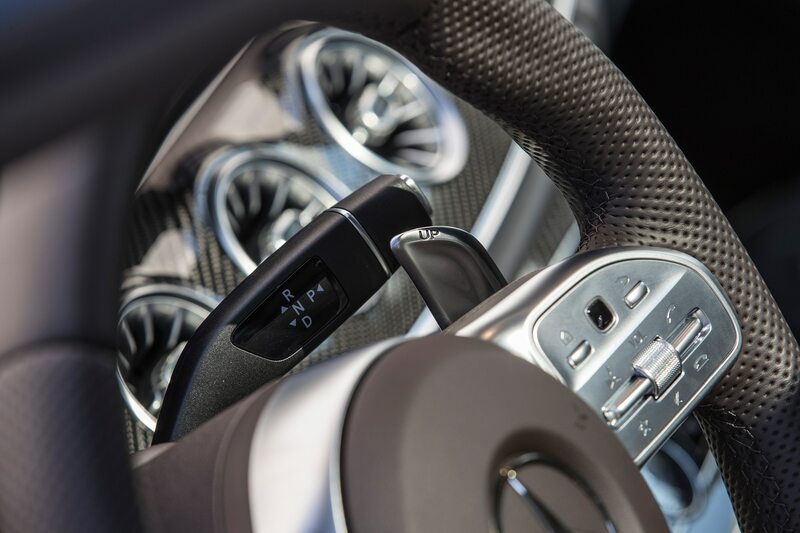 Nobody does ambient lighting like Mercedes. 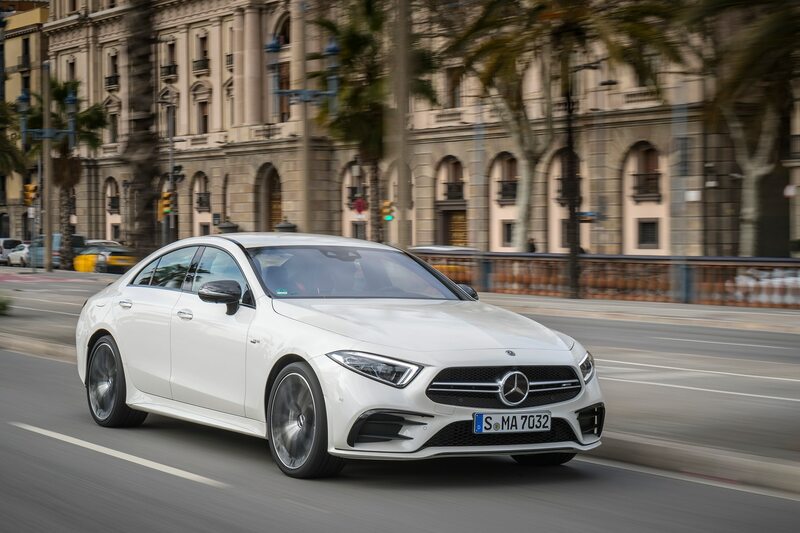 This all makes for a pleasantly luxurious Mercedes experience, even if you save some Bitcoin and go for the Benz CLS 450 4MATIC. 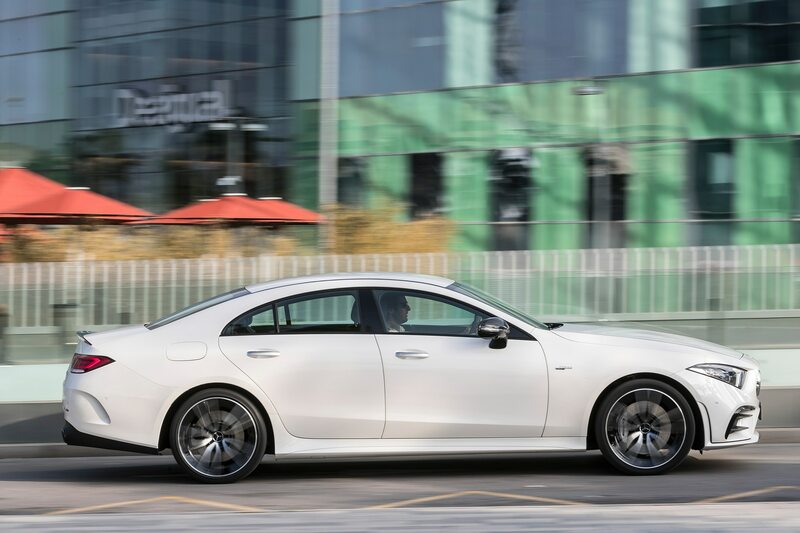 My drive partner and I tried to snag a rear-wheel-drive CLS 450 to see whether it might be the smart choice, but there were none to be had. 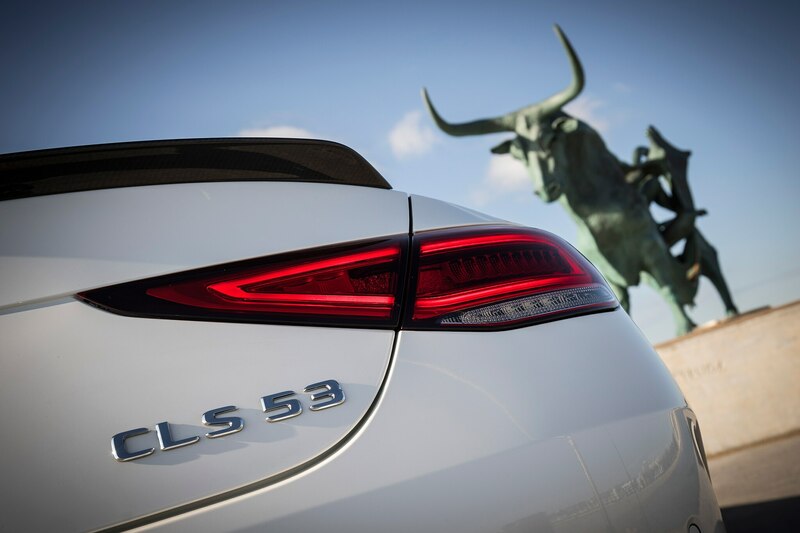 Thankfully, no North American journalists were subjected to the CLS 350d or CLS 450d diesels, which will not be imported to us. 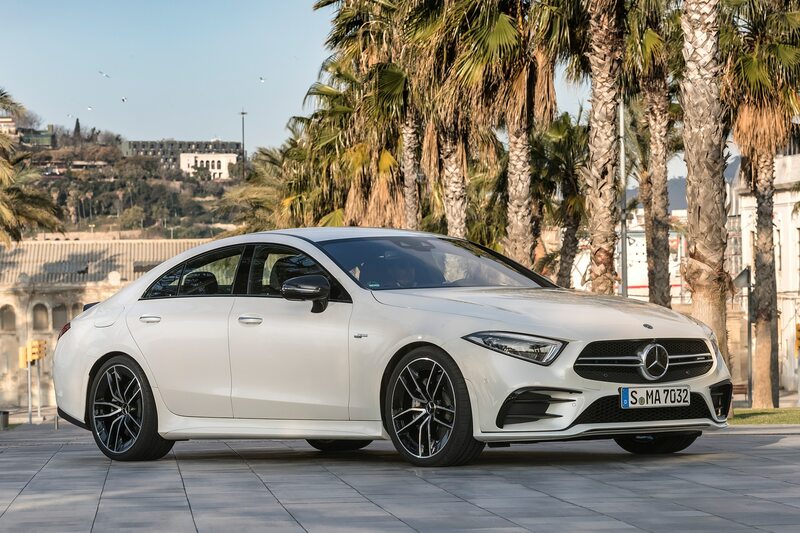 There is a Mercedes-Benz CLS 300 coming, with the 2.0-liter turbocharged gasoline I-4, though there are no plans to import that either, for now. 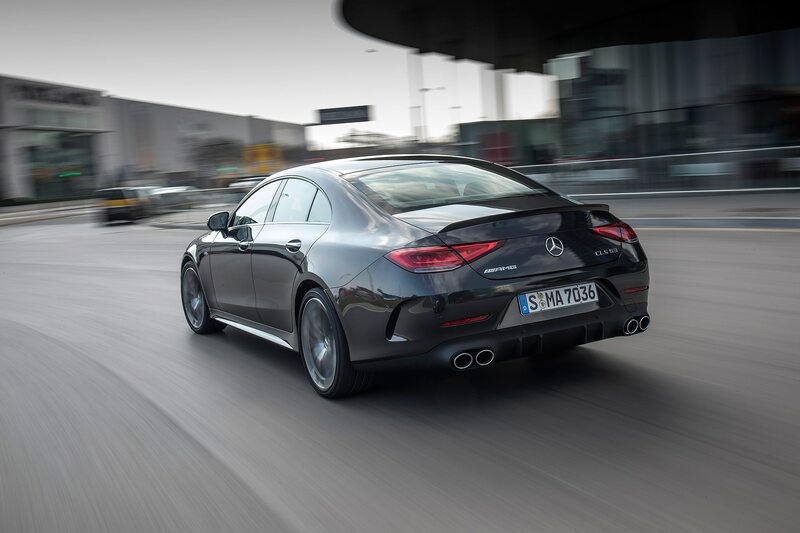 Anyway, the CLS 450 4MATIC is a pleasant enough car, though its slower, less-communicative steering becomes immediately apparent. 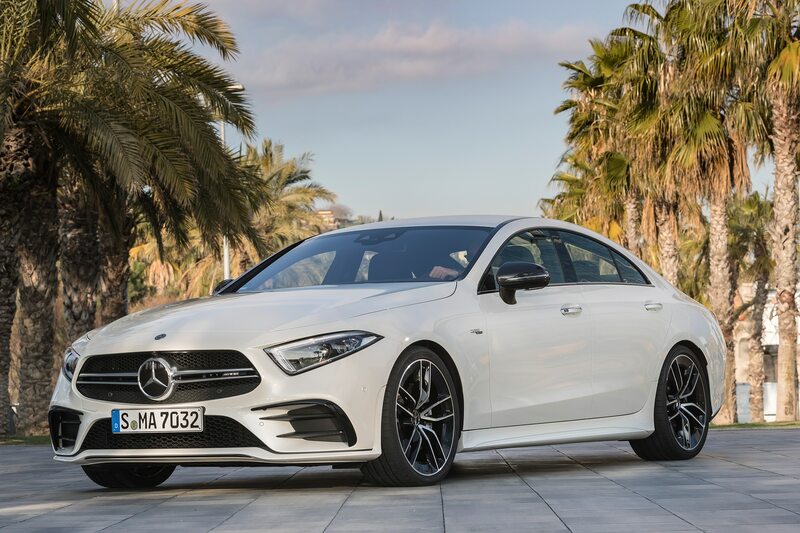 Its 3.0-liter inline-six is rated at a healthy 367 horsepower, plus the additional short bursts of 22 hp from the EQ Boost 48-volt system. 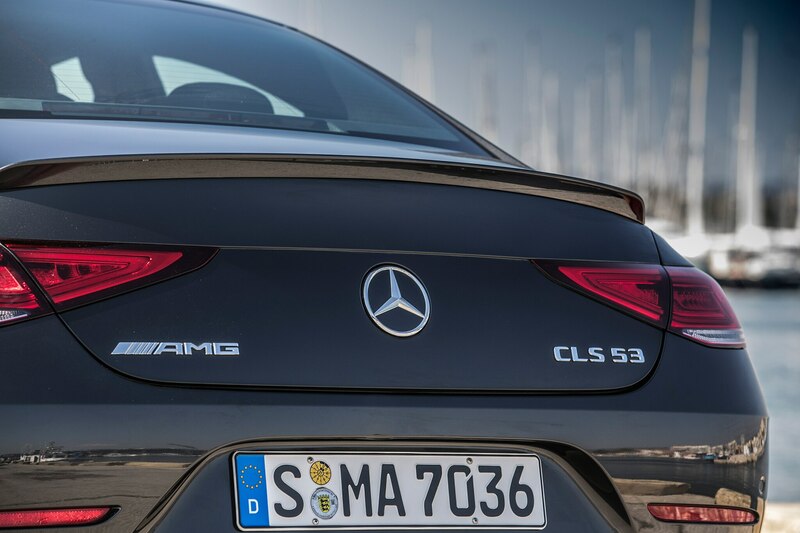 The engine isn’t that much less spirited than the AMG 53’s, but it’s not the sort of four-door coupe that begs you to give it a workout through the esses. 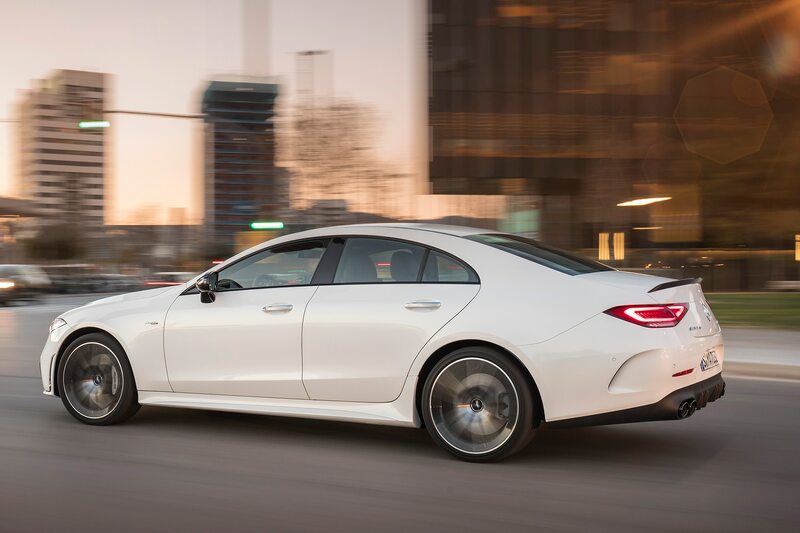 An E 300 probably will serve this segment of Benz customers better, with its more fuel-efficient turbo four and better rear seat space. 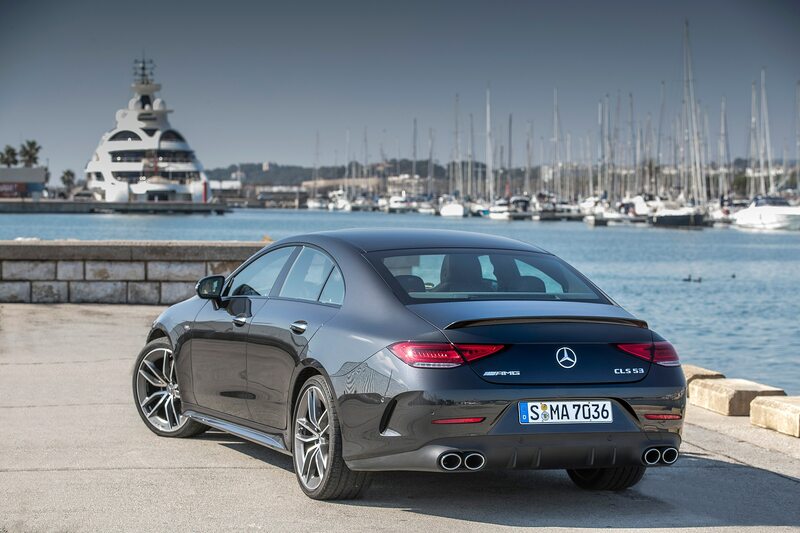 The CLS has ample rear legroom, and headroom is marginally adequate for this sub-six-foot driver, but as with all four-door “coupes” the roofline and beltline compromise the outward view from the back seat. 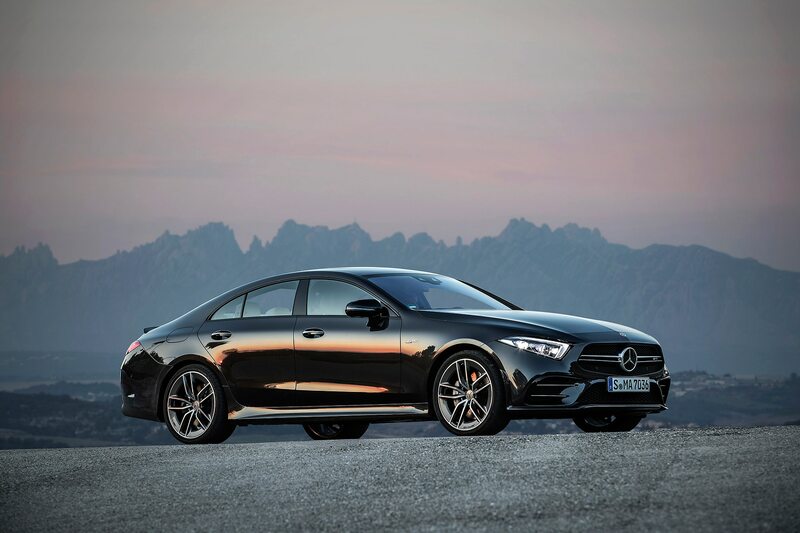 It’s the Mercedes-AMG CLS 53 4MATIC+ that hits the sweet spot. 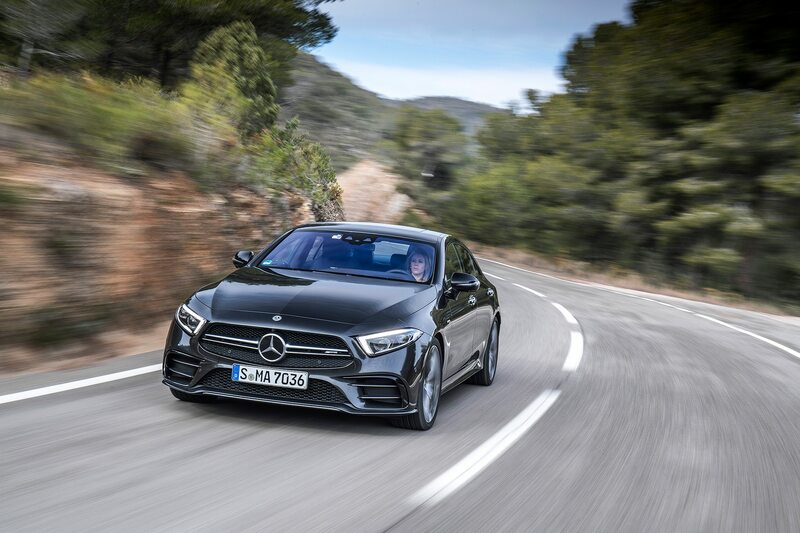 It’s the version of the car in which the dynamics best match the good looks, and it’s the sort of car we used to expect from Mercedes’ chief rival.